No Colts in this year’s Super Bowl doesn’t mean Indianapolis can’t still enjoy all the perks of the sacred Sunday. Colts fans can watch the New England Patriots and the Philadelphia Eagles vie for the Lombardi trophy without stressing about the thrill of victory or the agony of defeat. Here are 20 places to enjoy the game, halftime show, and commercials during Super Bowl LII. Located on W. Northfield Drive in Brownsburg, Scotty's serves traditional bar food as well as our own beer brewed at our Thr3e Wise Men Brewery in Broad Ripple, Indiana. Located in Brownsburg, Indiana we are in perfect proximity to all the excitement of downtown but just far enough to give you that home town feel. We pride ourselves on your great food and exceptional service. Founded in 2005, the bar has grown along with the town. New and exciting options are always available. Sidelines Sports Pub is the premiere sports pub on the west side. Located on Highway 36 in Avon, we are easily accessible at the western Walmart light, making us an easy choice for your night out. We have over 19 big screens including projectors. We also offer games and entertainment including pool, Golden Tee, Silver Strike Bowling, live bands, and a DJ. See our event schedule for more details. In addition to a great time, you can enjoy our large selection of draft and bottle beer including some great local favorites. While we may be known for our beer, our new menu is sure to please. So don't miss out! Come on out and “Get into the Game. Matt the Miller's is a comfortable, family-friendly restaurant with enough food on the menu to feed a football fan several times over. Enjoy drafts on tap and an extensive bottled beer selection, as well as wine and cocktails. Hang out at this fun, laid-back neighborhood bar and watch the Super Bowl on one of six TVs. Toast to the game with small-batch and common spirits, and a host of craft beers and Super Bowl pint specials. Food specials feature $10 pizzas, any toppings. The staff is putting together a tip board so football fans can score T-shirts -- word is one big winner will receive an enviable grand prize. Located in the historic Butler Tarkington area, Moe & Johnny’s is one of those cozy neighborhood restaurants where everyone really does know your name. This old-school bar serves up Indiana craft brews including the Triton Sin Bin BPA and Railsplitter IPA and 3 Floyds Gumball Head and Alpha King. This well-loved Northside establishment, in its 29th year, will show the Super Bowl and NFL Sunday Ticket on 45 HDTVs and seven front-screen projectors. Start the Super Bowl party early at Jockamo’s in historic Irvington with a wide selection of gourmet pizzas and draft and bottled beers including Indiana craft brew Sunlight. Warm up on game day with the roasted pepperdews stuffed with goat cheese appetizer. Take the Super Bowl party home with Jockamo pizza carry-out on Sunday. Downtown or Broad Ripple, Kilroy’s is a game-lover’s dream with more than 40 TVs. Choose from a $5 Stoli bloody Mary or Jim Beam whiskey drink and $15 Coors Light and Miller Light buckets. For a real party, try a 32-ounce Long Islands and a basket of Kilroy’s famous stuffed breadsticks. Think vintage sports bar-meets-high tech. 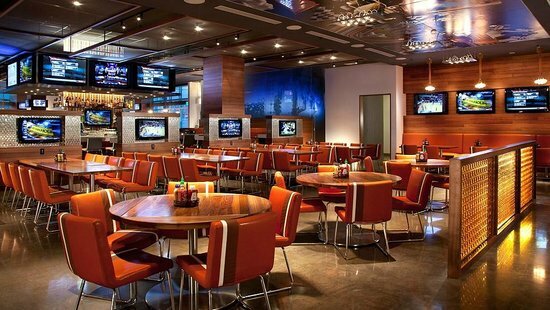 High Velocity is an upscale, family-friendly place with a multi-dimensional media wall and more than 60 HDTVs. Specials include $2 Coors Light bottle all day and $1 sliders and 25-cent boneless buffalo wings during game time. The Northside favorite has expanded its sport-bar accommodations to include more than 20 TVs, including two 120-inch and 140-inch high-def big screens. No visit to the Mousetrap is complete without tasting the famous stew or giant pork tenderloins. There are also pool tables, dart boards, a ping-pong table and board and video games for multi-tasking fans. Cozy up to the fireplace at this family-owned Fishers establishment and watch the game on the newly remodeled bar’s 37 HDTVs and 7 HD projectors. Super Bowl specials include one large, one-topping pizza and a 64-ounce Miller Lite or Coors Light pitcher for $17. There will also be small giveaways during the game. If it is sports you want, we have a total of 8 HD televisions. During Super Bowl week, we served over a “Half a Ton” of Wings , but what the heck, that’s almost becoming a normal week. If we sold half a ton of our “Best Wings in Indy” over Super Bowl week and you haven’t tried them yet, you are missing out! St. Paul, Minnesota is where Champps began. A modest little restaurant, it was the kind of place where locals met up to catch the game and where neighbors became friends. A place where Midwestern values were generously shared with everyone. We’re people people. We serve our own take on American comfort food. And we do it with equal parts pride and grace. That’s our story. And it’s a delicious one. This lively Downtown sports bar was established in 2003 in honor of all the coaches out there, and they know who they are. Drink specials include $4 Captain Morgan and Jagermeister and $5 mimosas and Stoli bloody Marys. Billiards aren’t the only sportsy draw at the OPT. This Broad Ripple institution will serve up specials including tableside 100-ounce beer towers, pints of domestics, and chili cheese dogs. Watch the game by the barroom fireplace or the billiard tables on OPT’s 18 big-screen HD TVs and win prizes including free shirts and beer. This award-winning Dublin industrial pub in Carmel is known for its perfectly poured cold pints of Guinness; make sure to order the corned beef for good luck. Chatham Tap will be business as usual on Super Bowl Sunday, meaning the party will be rousing. The National Football League will join the pubs’ sports programming mainstays, the English Premier League, UEFA Champions League, World Cup, and European Championships for American football’s most celebrated game of the year. Try the portabella mushroom fries and specialty pizzas such as the Meaty Kuzola, specifically for its name. With 15 locations in Indianapolis, BW3 covers the gamut of what the old-school Super Bowl fan appreciates: Sports, beer, and wings. In no particular order. And with 16 signature sauces including mango habanero and parmesan garlic, plus five options for seasonings, BW3 does the chicken wing justice. There are also, of course, a lot of TVs. The Whistle Stop is known for its spirited atmosphere for tailgating before Colts games. Super Bowl Sunday at this friendly bar will top that. There will copious amounts of food and appetizers and $1 off any drink for guests.